FINDING HIS WAY Charlie Plummer stars as Charlie, an adrift teen who takes a job working with race horses, eventually stealing one that's headed for the slaughterhouse. Glen This coming-of-age story wasn't what I expected from its trailer, and even the synopsis above doesn't accurately signal the dark story ahead. This is really about a kid who's forced to grow up too fast—a kid without a role model, stable family life, or opportunity. Charlie's single dad, Ray (Travis Fimmel), is a womanizer. It's not that he's a bad father, he simply can't provide a normal life. Charlie's frequently left alone with no food in the house. We learn that he doesn't know his mother, who left Ray and Charlie when he was little. To his credit, Ray is doing his best for Charlie, though his best is far from enough. While out for a run, Charlie happens upon a horse racing track, where he meets washed-up trainer Del, who gives him a job. The look of satisfaction on Charlie's face after his first payday is priceless. He's growing up and finding his own way. Del introduces him to female jockey, Bonnie (Chloë Sevigny), who warns Charlie not to get attached to the horses. They're there to race, and if they can't win, they'll be shipped to Mexico, where horse butchering is legal. Things seem to be looking up for Charlie, but then everything goes wrong. I don't want to ruin the film's surprises, but suffice it to say Charlie finds himself entirely on his own and on the run. The second half of the film turns into something of a road trip, and along the way Charlie meets various people, from whom he learns valuable and sometimes dangerous lessons. He's a survivor, and he's desperately trying to get to Wyoming where he hopes to reconnect with his long lost aunt, Margy (Alison Elliot). If you're expecting a feel-good story with a Hollywood happy ending, this ain't it, but it is a tender elegy to a childhood snatched away too soon. Anna It certainly wasn't the movie I was expecting from the trailer, though I must say bravo to Haigh for not giving away the film in that regard. Charlie is a sweet kid, on his own while his dad works, but he's OK with it and not afraid to put in hard work if it affords him some freedoms. Ray is kind of a loser who moves a lot for work and barely seems to scrape by, but all in all Charlie doesn't seem to mind and clearly cares for his dad. When Ray sleeps with a married coworker, both father and son take advantage of her kindness of cooking a meal. Anything is better than Cap'n Crunch three meals a day, right? Charlie used to play football, but his size boxes him in to only a couple of positions, and moving around a bunch has left him without a team. He's a good kid, if a bit neglected and friendless, but his heart is evident when he uses his salary to buy food for his dad and himself. Del is a tough-talking, no-nonsense S.O.B. whose washed up horse racing career is in dire straights. It would be great if this was a guy Charlie could look up to. If so, we may be looking at a different story entirely. Unfortunately, Del is little more than a cheat and a jerk, leaving Charlie adrift once his family is left in peril after a violent break-in and grave injury to Ray. 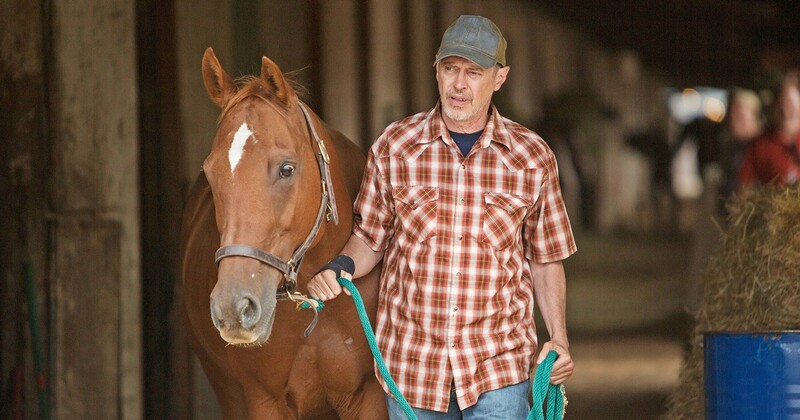 NOT A ROLE MODEL Steve Buscemi stars as Del, a washed-up horse trainer with scant respect for his horses, especially the ones that don't win despite his unethical methods. Glen Desperate characters populate this story. It's not the haves but the have-nots who we see, from a couple of young veterans left scarred by warfare, to the overweight granddaughter of a mean grandfather who takes his abuse because she has nowhere else to go, to a homeless man named Silver (Steve Zahn), who seems willing to share what little he has to help Charlie. In short, everyone in this story is wounded. The message seems to be "life happens, and it leaves a mark." It's about surviving and learning from your lessons and moving forward. Despite it not meeting my expectations, this is an affecting film. The acting is incredible, especially from Plummer as Charlie, but Fimmel, Buscemi, Sevigny, and Zahn all turn in nuanced and engaging performances. It's also beautifully filmed, especially when Charlie hits the road across the wide-open plains and prairies of the Western U.S. Even though the film is somber with some tough-to-watch moments, I found Charlie engaging and likeable. He's just a kid and prone to kid mistakes, and even though he steals a horse, truck, and trailer, his motives are never less than noble. When he's forced to resort to behavior he abhors, his guilt about it is palpable. He's forced to create his own justice in an unjust world, and that's a burden no teenager should have to bear. He's taken an unforgettable journey, weathered hardship, and crossed ethical lines, but he never lost his soul. That's enough of a happy ending for me.